Our pre concert concert in the foyer of Symphony Hall on September 8th has been cancelled. Apparently Symphony Hall are running some other event on that day so we are out. We are very disappointed about this, so sorry. 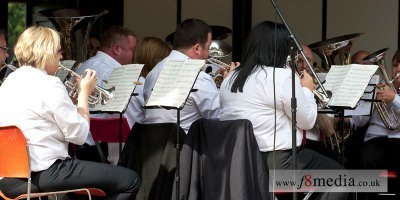 July 6th saw the band taking part at the Pershore Band festival; what a wonderful event this is. 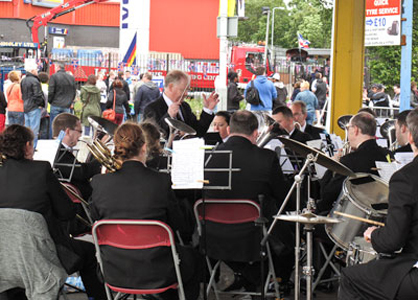 We were first of all in the Marquee where we performed a traditional light band programme. We followed that in the Abbey at 19;10pm with a far more challenging programme. We were thrilled to be accompanied by Professor Philip Wilby on the Abbey organ. We featured two original works by our 2nd cornet Robert Foster; first a Tuba Concerto written for and featuring Paul Jones and then a challenging work from Robert called "Affinitas" written in appreciation to Philip Wilby for his supporting Robert in his compositions.. Here are some remarks from Philip following the concert. "What a great concert! Beautiful playing, and loads of variety! mark for me, but the whole programme was a real treat. grateful to the performers.... really excellent advocates with a taste for hard work. Bravo! Thank you Trevor for your generous invitation. I really enjoyed myself! ..... And thank you Rob for another great score. Again...... thank you so much....... In your debt! Take a look here for some video taken in the Abbey thanks to Jay and Amy Willis for this. 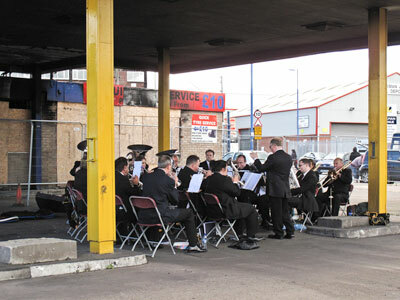 Tickets are now available for our concert at Netherton Art Centre on 1st June starting at 7.30pm. This year the theme is music from the Oscars; popular music from great films. We are also pleased to present the Netherbrook Primary School Choir who were the outstanding winners of the Merry Hill christmas singing competition; a treat for all. Sunday 10th saw us at Bedworth again, this time in the championship section; test piece was the formidable Philip Sparke's Harmony Music, a real baptism of fire. We were drawn to play number 2 which was OK so we didn't suffer the agony of waiting around too much. We were happy with our performance, a few uneasy moments but that's to be expected with such a demanding piece. At the end we were placed 9th out of 11 bands, doesn't sound too good on the face of it but we were quite pleased considering the level we are now at. Subject to confirmation it also means we stay in the top section for another year; a great platform to build on. Thanks must go to our conductor Trevor Jones for his hard work and patience in preparing for the band to punch above it's weight at the contest. We are happy to report that Viki's baby boy was delivered safely on Monday 11th February. We are so pleased that mother and baby are both fine, congratulations to Viki and Gez. 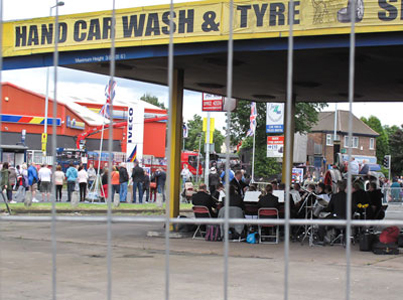 For reasons beyond or control we have had to cancel the concert scheduled for 2nd March at the Cradley Heath Salvation Army. This is most unfortunate and we say sorry to all our faithful supporters. We hope to arrange an alternative date as soon as possible. We are happy to report that our principal Euphonium, Viki Southall is expecting her 2nd baby; the baby is due on 11th February so all our best wishes go to Viki. This does mean however, that Viki will not be able to take her place with us at the area contest at Bedworth in March. Ian Sant has stepped up to play principal and a fine job he's doing too. We are seeking a short term replacement and we are hopeful of securing a player shortly. As we are now into 2013, we would normally archive all the news items in 2012 into another page but we will keep it open here for a while at least for you to follow. Thanks to all who assisted with our carol playing this year. We had a much better than expected result; we collected over £1600 so well done.- This is a valuable income. 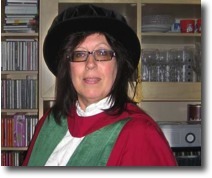 Congratulations to our 2nd Baritone, Valerie Trim on achieving her Phd (Doctor of Philosophy), her thesis (80,000 words) was concerned with Literary theory and Semiotics (no, me neither) and will eventually be published on line!! To quote Val "I can't quite believe I've actually achieve it -- I've worked hard for five years, often eight or ten hours a day, and at the moment I feel like you do when you've had toothache and now the pain has stopped -- but somehow you miss it…." A bit late, but here we are playing in the foyer of Symphony Hall prior to the massed band concert on the Sunday after the British Open. Sorry but we have had to cancel the concert planned for 10th November at Netherton Art Centre. It has been re-scheduled for 1st June 2013; a long time we know but should be well worth waiting for. Following our 2nd place at Bedworth in the regionals in March we were at the National Finals at Cheltenham (23rd Sept) in the 1st section. 17 of the best 1st section bands were competing from all over the UK and we were placed 8th; we were very pleased with this result considering the quality level of this competition; also we were pleased to be the highest place Midland band. Our congratulation go to Penny Handford who, only two weeks ago stepped up to play 1st Baritone which was featured in a nerve racking un-accompanied first few bars; well done Penny. Yesterday, 16th September was the Wychavon Festival of Brass Contest held at Droitwich. We performed in the 1st section and were awarded 2nd place with 8 bands performing a 20 minute entertainment programme (our programme can be found here), this was a very pleasing result. We hope this will provide a solid platform for our performance in the National finals at Cheltenham next week ; but we are under no illusion; next week we up against the finest bands in the nation so it will be tough. Congratulations go to the the Filton Band from Bristol for their winning performance. Yesterday 9th September in Walsall Arboretum there was a Bandstand Marathon with all types of music on all day. We were invited to present a short concert in the afternoon to quite a large and appreciative audience. Afterwards we had a rehearsal for Wychavon and the Nationals at Broadway United Reform Church. Louise, our first baritone player gave birth to a baby Daughter Lylia Louise at 16.55pm on Monday 27th August. Mom and Daughter doing well; and Dad Steve too. Big congratulations from all the band. We are so looking forward to having you back with us. You can see some family photo's on Lou's Facebook pages. Just found some good links to Phoenix stuff on the net. 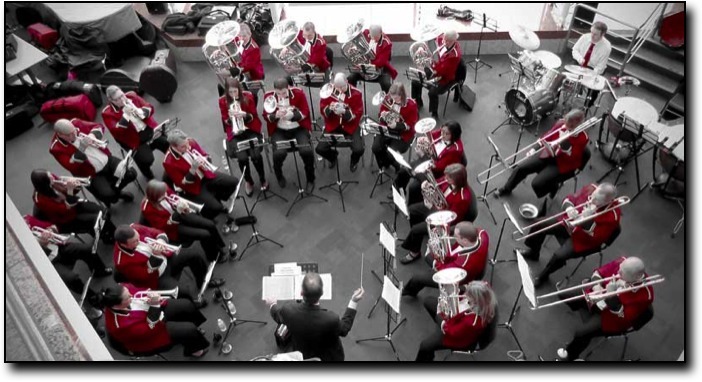 Video can be found here of the band playing Broadbent's march Centaur at Himley Road methodist Church earlier this year. Also found a chart of our contest history here, Makes interesting viewing. Saturday 21st July we were at Pershore performing a general entertainment programme at the Angel Inn and an all Eric Ball programme in the Abbey, we had a great time and we think the audience enjoyed our performance. Pershore Festival is a first rate showcase for us brass bands and congratulations to the organisers for their sterling work, and thankfully we had great weather after all the recent rain. Our 1st Baritone Louise is taking a break from the band for a while, she is expecting her first baby in a few weeks, we wish Louise all the very best and look forward to having her back soon. Also our congratulations go to to our lead percussion Dave, he is getting married on August 25th so we also extend our best wishes to Dave. 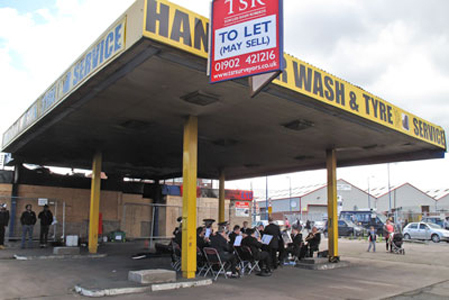 On 30th June the Olympic Torch relay came thro' Wolverhampton and guess what, we were given a "prime" east side spot on the corner of Hickman Street, in a derelict petrol station, but we had to laugh about it; thankfully the rain held off and we were blessed with some sunshine whilst the torch came by. Here are some momentous pics of our place at the event. On May 26th we did a concert at Himley Road methodist church to assist with the church fund raising; in the winter the church boiler broke down, so since then they have been holding their services in the church hall where the heating is OK. The estimates for repair are in the region of £20,000 as it will require replacement of not only the boiler but many other parts of the system. We helped raise £696 at the concert, whilst no where near enough it at least goes some way to help. We had great feedback about our performance and we were only too pleased to help our friends at the church. April welcomes the launch of our new look website, it's been a long time coming but we are now pleased it's working and we intend to develop it further and also keep it up to date. Please contact us here if you would like to comment. March 10th see's the band qualify for the Nationals following the award of second place in the first section at Bedworth Town Hall -- In 5 years, 2 firsts and 2 seconds, we are so proud. This also means we are promoted to the Championship section for next season commencing January 2013, lets hope we can do better than last time when we were relegated after just one year, but nonetheless it was a great experience.